Duke Nation, welcome Zion Williamson to The Brotherhood! Today is the day most college basketball fans have been waiting on, Zion Williamson's commitment day (also if you're wondering why the title of this article is what it is, stay tuned until the end). The five star recruit made his shocking announcement this evening, that he will be attending Duke University next year. Another shocking turn of events prior to Zion's decision day was Jordan Tucker's transfer from Duke to Butler. 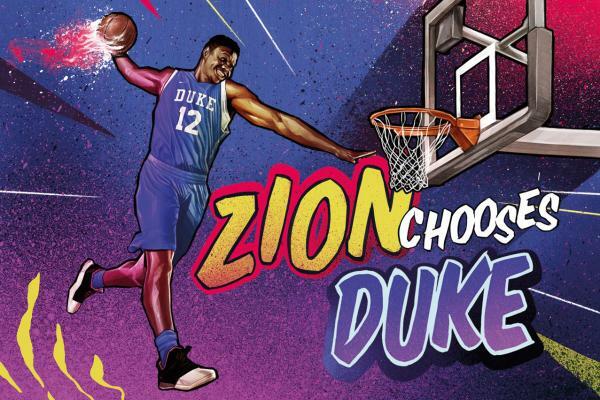 This had people wondering if Tucker secretly knew about Zion committing. Who actually knows... also the rumors quickly spread like wildfire of Zion committing to Duke before he officially announced, due to leaked photos of him in his Duke jersey. Many claimed these photos to be photo shopped and had lots of fans wondering, but they were indeed real (pictured below). Zion will be joining alongside other top recruits, Rj Barrett, Cam Reddish, and Tre Jones. This is the first time in NCAA history that the top three recruits have all chosen to attend the same university. To be honest, I was not expecting it at all, but I am extremely excited about the results. Thanks to Coach, or should I say, Goat K's recruiting powers. A few key points/fun facts about Zion: he is one of the few lefties to be joining The Brotherhood (others include Rodney Hood, Justise Winslow, and Luke Kennard). His mother was his middle school basketball coach, pretty cool if you ask me. Although Zion is considered a forward, he is described as a position-less player. Scouts were drawn to him for his extreme athleticism and explosive slam dunk ability. Many experts have compared him to Lebron James, and Julius Randle. Roy Williams even compared him to Micheal Jordan, saying he is the best player he has seen since MJ. Now about the title, Troy and I were actually in a wedding earlier today, on the way back home we stopped for some Chick-fil-A dinner about an hour before Zion committed. As we were leaving, we both got the notification from ESPN that Zion had chose Duke. It was such an exciting moment. Drake's newest song "God's Plan" had just dropped the day before, and if you've heard the song, then you know its one to hype your mood up. While we were on the way home the song came on shuffle, and it was one of those moments where you just want to enjoy the excitement. Me being the crazy Duke (and Drake) fan girl I am, mixed Zion into the song lyrics, thus became "I only love my bed and Zion, I'm sorry." The organic moment was caught on video, so it was only right to post it and share the fun with my fellow Duke friends. Also ironically enough, Drake happens to be a Zion fan and friend. With Drake being who he is and also a Kentucky fan, many people thought he may influence the big decision a little. Especially because of the fact that Zion refers to Drake as a "big brother" type figure. Check out the video links below to see what Zion has to say about their relationship. One things for sure, the potential for this upcoming team just keeps getting better and I am excited to see what Zion has to offer for Duke. Until the next Duke commit, "I only love my bed and Zion, I'm sorry" (not sorry).